In a famous craft beer and distilling city like Denver, you may think it’ll be hard to find things to do outside of brewery hopping, beer festivals and cocktail sipping. Though it does feel that way sometimes — even for locals — we’re happy to tell you there are plenty of ways to hit the town sans booze. And some of them even include donuts and candy! In this guide, we rounded up some of our favorite spots in Denver to have fun, learn, eat and even drink (mocktails and kombucha, of course) without the alcohol. Enjoy! Located inside The Source, Acorn is an eclectic and contemporary American eatery with a solid foundation in oak-fired dishes. Their seasonally rotating menu features family-style small plates and entrées alongside an impressive beverage program that includes non-alcoholic drinks. The cocktail list is organized in three sections—booze-free, low booze and high booze—and the booze-free section showcases refreshing ingredients like coconut water, blackberry tea, aloe, Fee Brothers bitters and house-made ginger beer. 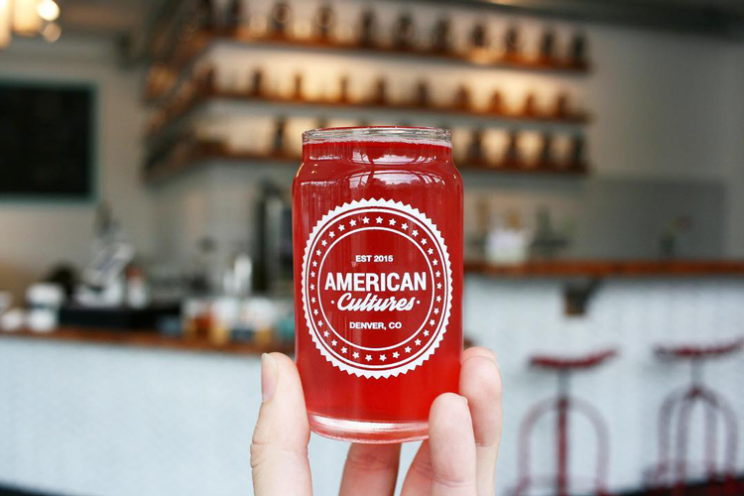 Drink kombucha at American Cultures. Sip mocktails at Bar Helix. Located in the heart of RiNo, Bar Helix is a must-visit destination for cocktail and mocktail drinkers alike. Their extensive cocktail list includes a seasonal rotation of booze-free cocktails that are as inventive and as delicious as the boozy ones. See a show at The Black Buzzard. 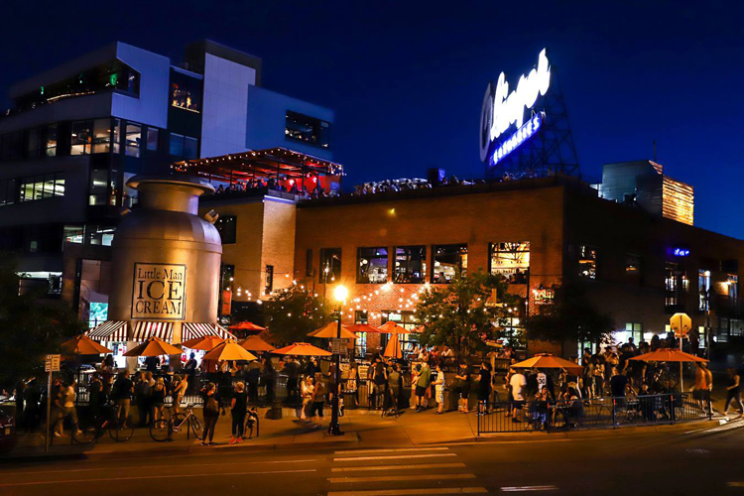 The Black Buzzard is the first event venue by Oskar Blues in LoDo. The name comes from a drink made at the team’s restaurant in Longmont made with bacon-infused bourbon and Ten FIDY Imperial Stout, but unlike many other comedy venues, The Black Buzzard doesn’t have a drink minimum. That means you can laugh at stand-up comedy shows, join in during open mics or dance along to live music without any pressure to drink. 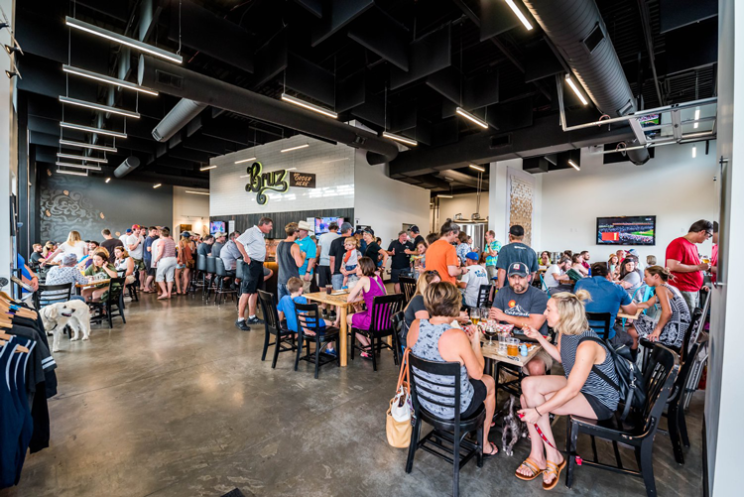 Bruz Beers is an artisanal brewery in Denver that focuses on brewing traditional, Belgian-style and Belgian-inspired brews. Alongside those inspirational beverages, they also offer several varieties of kombucha on tap; these can be mixed with any beer or enjoyed alone. Take a class at Candelaria. Located in Denver’s Santa Fe Arts District, Candelaria is a maker’s studio, retail space and candle shop selling candles that are made by hand in small batches. In addition to the shopping opportunities, they offer a range of classes including candle making, fluid art, pressed botanical art and more. Attend an event with Daybreaker. The Daybreaker story begins in 2013 in Brooklyn after several frustrating nightclub experiences recounted by Founders Radha and Brimer. Their first Colorado events were held in 2016 and the team has made regular appearances in Boulder and Denver ever since. Centered around energy, community and joy, these events begin bright and early with one hour of yoga and fitness followed by two hours of dancing. The woman-owned business is also eco-friendly and no alcohol is ever served. To see the calendar and find out when they’re returning to Denver, click here. See a show at the Fillmore Auditorium. The Fillmore is one of Denver’s most popular venues and has hosted just about every genre of music you can imagine. Located on Colfax between The 1up and The Ogden Theatre, their general admission floor offers tiered standing areas and is decorated with huge chandeliers. Though the venue does have bars, they’re not as in your face as they can be at other venues, and the team also serves snacks and healthy food! Brewery tours are found on most Denver itineraries (and there are quite a few options), but beer isn’t the only thing you can learn about in the Mile High City. At Hammond’s Candies you can see how the famous lollipops, candy canes and chocolates are made then take home a freshly made treat! Hammond’s Candies is an industry icon and was founded right here in Denver nearly 100 years ago. Brewed for more than 3,000 years in the South Pacific Islands, kava is a root that can be made into a relaxing, social beverage. At Kavasutra, they’ve developed a fun and tranquil environment where anyone is welcome to come and try a shell of premium kava. For more information on Kavasutra and their kava, click here. Escape from King’s Escape Room. King’s Escape Room has created a unique escape room experience right here in Denver. Their puzzles are carefully designed down to every single detail and are generally low-tech for an authentic experience. Current and past themes have included Game of Thrones, rock and roll in 1972, and even the Chicago Cubs. Catch a movie at Landmark’s Mayan Theatre. Originally built in 1930, the Mayan Theatre is nestled in the Baker District. One of the country’s three remaining theatres designed in the Art Deco Mayan Revival style, the venue was renovated in 1986 and is now an intimate, three-screen palace with an upstairs cafe. Their calendar includes critically acclaimed indie movies, Oscar nominees, throwback screenings and more. Get ice cream at Little Man Ice Cream. Mercury Cafe opened the doors to this cozy, Denver location in 1990. Since that day, they’ve developed into one of the most fun places to hang out, enjoy a meal, see shows and dance in town. Weekly and monthly events include poetry readings, jazz and classical concerts, community theater, film screenings, indie music shows, yoga and meditation classes, and dedicated evenings for West Coast Swing, Tango, belly dancing and more. Lounge on the patio at Stella’s Coffee Haus. A staple on South Pearl Street, Stella’s has been serving up lattes, espresso, iced matcha, homemade chai, towering cake slices, tasty neighborhood treats and more since 1991. Their dog-friendly patio — complete with fire pits in the front and back — is a favorite hangout on cold winter days, warm summer evenings, and during the South Pearl Street Farmers’ Market. One of the only late-night coffee shops in the city, Stella’s is open until 11 p.m. or midnight every night of the week! To find more local coffee shops, check out our guide 23 Denver Coffee Shops You Need to Visit. Drink tea at Teatulía Tea Bar. 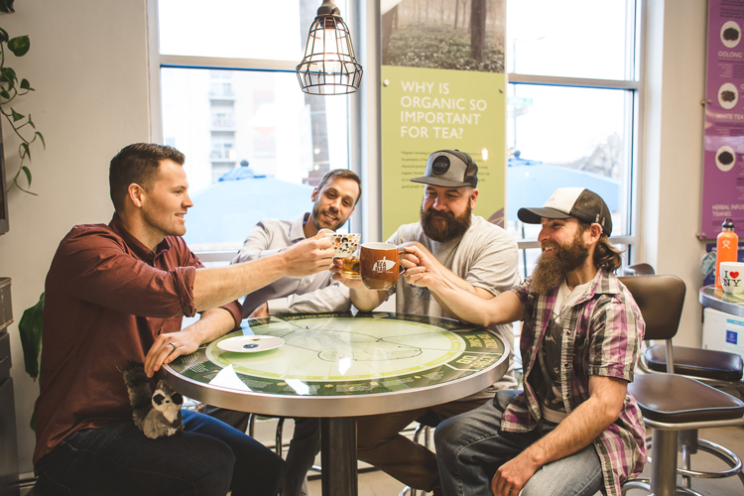 Teatulía is a Denver company that makes garden-to-cup teas sourced only from their very own tea garden in the Tetulia region of Northern Bangladesh. At the Teatulía Tea Bar, you can taste those inventive concoctions alongside a selection of other teas, locally roasted coffees, and fresh, local, handcrafted food sourced from around Denver. Chow down at Voodoo Doughnut. Voodoo Doughnut famously began in Portland’s Old Town, but now their pink boxes and outrageous doughnuts can be enjoyed right here in Denver, too! Located on Colfax with street parking only, you can run into this eclectic bakery for gargantuan creations like the Bacon Maple Bar, the vegan School Daze “PB&J”, the raspberry jelly-filled Voodoo Doll and more. In total, their menu includes more than 50 different doughnuts topped with things like Froot Loops, Oreo cookies, banana chunks, marshmallows and more. Sip local kombucha at Woods Boss Brewing Company. A beloved craft brewery in Denver, Woods Boss crafts some of the city’s best beers. Alongside those rotating brews, they also offer TruBucha on tap! This local kombucha is made at a family-owned kombrewery located in Lone Tree. Psst… For those looking for more fun and support, our city is also home to Sober AF Entertainment, a nonprofit organization that works to promote fun in sobriety and create safe, sober areas and tailgates at sporting events and festivals throughout the year. In the comments below, share your favorite things to do in Denver!